BULLETIN: Sandy Asher’s upcoming play in New York City, WALKING TOWARD AMERICA, has now sold out its first three performances and has fewer than 30 tickets remaining for its fourth. If you have been considering it, now’s the time to order your tickets. My Sandy and I have ours and look forward to combining the excitement of attending Sandy’s play with the other venues that are available in that great city. Here’s the link to guide you as your order your tickets. http://walkingtowardamerica.wordpress.com . It was fun to join Larry Brimner and his workshop attendees on Monday. In browsing through some of the posted pictures I ran across one of me during my Skype visit. From where I sat in my office, I was looking down on the room and could see everyone fairly clearly. 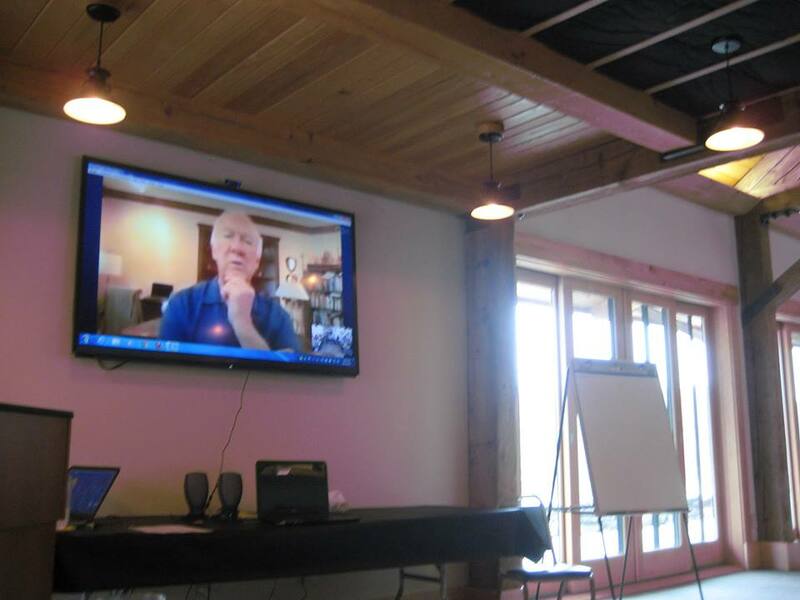 I knew that my image was large because in my workshops at The Barn I’ve watched my own Skype guests, J. Patrick Lewis, Renee LaTulippe, Jane Yolen, and Kenn Nesbitt on that wall. Now I’ve seen it both ways. My thanks to Larry for inviting me and a special thanks to all of you for recommending your favorite blog sites. I compiled the list and provided it as a handout at the workshop. An hour passed quickly.